New LiftMat low-profile lift tables from Southworth Products have a lowered height of only 3.25 in., substantially lower than conventional lift tables, according to company officials. The lift tables help increase productivity and improve worker safety in a range of industrial applications. 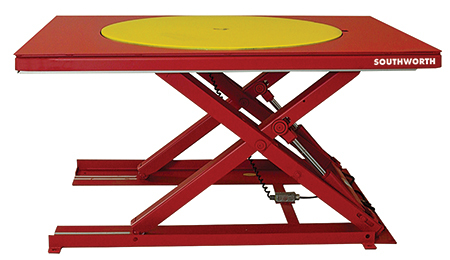 Ideally suited for palletizing, the LiftMat enables unobstructed access to all four sides of a palletized load. As boxes are added or removed, the platform is raised or lowered to a comfortable height with a powered foot switch or a handheld pushbutton remote. This eliminates the need for bending and stretching, thus reducing worker fatigue and minimizing injury risks. The tables, in platform sizes from 24 by 60 to 48 by 96 in., feature a lift capacity of 2200 lb. with a raised height of 31.5 in. A full-perimeter toe guard stops downward travel should the lift contact any obstruction. An optional ramp allows workers to load and unload the platform with a hand pallet jack, making the LiftMat ideal for use in areas that can’t be accessed by a forklift. To increase worker productivity, some units can be equipped with an optional turntable that essentially sits flush to the platform, allowing users to spin the load so they can remain in one position throughout the entire loading and unloading process. A rotational lock prevents the turntable from spinning when not use. For lifting and lowering, an external power unit comes prewired with a 115-V cord and plug. See also: Southworth Products Corp.